Hmmm, just what is wig care and why should you care about it? Well it's quite simple, the way you look after your wig determines how long it will last. Love your wig and it will last longer and part of that is about washing your wig. So, whether it's a synthetic wig, human hair wig, lace front wig, lace frontal, full lace wig, hairpiece or extensions, below is a no-nonsense-super-easy-peasy way to keep your wig looking great and maintains its lustre. If you have a human hair wig, it’s an idea to keep in mind that although a wig it’s still human hair and needs to be handled in the same way. If you have a synthetic fibre wig, it’s an idea to keep in mind that although synthetic, it still requires washing in a way that will minimise tangling. To avoid tangling which can lead to shedding, it’s best to wash the wig in the way described here. This reduces the likelihood of tangling and again is critical to maintaining your wig. Use your free hand to squeeze from the top and work your way down never wring the hair. Rinse the hair. If the hair is clean, then repeat the steps 2 - 7 above to rinse the hair. 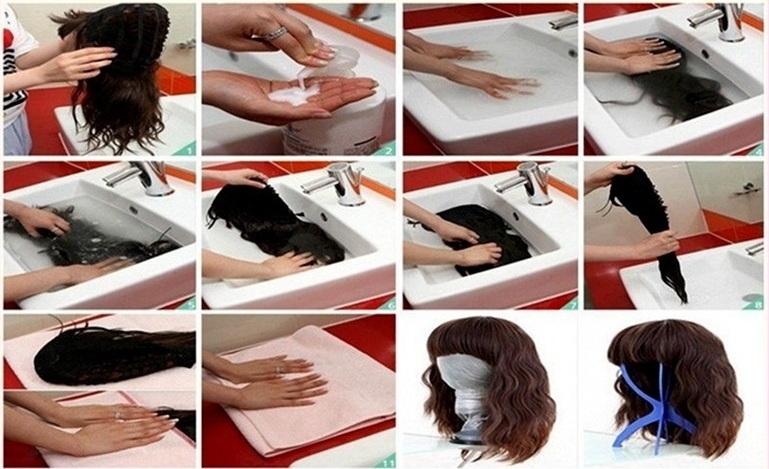 If the hair is not fully clean, then repeat steps 3 - 7 until it is. To dry, place the wig, hairpiece or hair extensions flat on a clean dry towel and fold the towel over the hair and blot (press down). If using a nourishing oil or moisturiser, when the hair is still wet but not sopping wet, pick up the wig, hairpiece or hair extensions and apply your nourishing oil by spraying the hair; if you don’t have a spray bottle then (get one as soon as you can!) you can apply the oil to your hands and then squeeze the length of the hair as in the 8th image. Place the wig on a polystyrene (Styrofoam) head or wigstand and leave to air dry. If you have curly wig, it’s best to place the wig on the stand whilst the hair is still able to drip dry. This will allow the set curl pattern to return. If you absolutely must, must, must use a hair dryer, then use a low temperature and low speed setting and hold the hair dryer at a distance of about a metre in order to reduce damage. A great humectant (substance that helps retain moisture) is the readily available glycerine: a mix with water at a ratio of at least 1:10 (one part glycerine and ten parts water) is a great way to stop human hair drying out and water will seal in the oils you've applied to the hair. It’s a little known fact but leave-in conditioners actually dry out human hair and make it brittle. So as part of your wig care, ensure the hair on your wig is nourished with a good moisturiser or oil - vegetable and nut oils are best such as, argon oil, coconut oil and almond oil. When you wash your wig you can also use a deep conditioner and apply heat to allow the protein to penetrate the hair and ensure that it remains as healthy as possible and leave to air dry. As part of your on-going wig care, it’s also an idea to keep the heat styling to a minimum – our in-depth styling guide has more on this. By treating the wig like this you’ll be able maintain the lustre and look of your wig and, although it may seem like a lot to take in, once you’ve had your wig for a while, washed and styled it a few times, it’ll become second nature to you and easy to do.